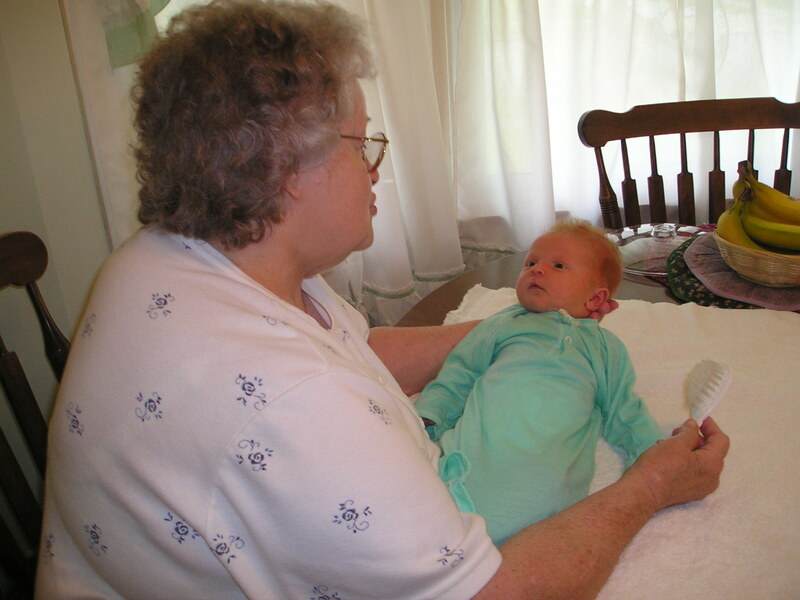 From the time I got pregnant I knew this baby would be a huge part of my Grandparent’s lives. We only lived 4 doors down on the same block so I spent a lot of time up there all big and pregnant. Then when the time came to be induced I called Chad at work to tell him and ran straight to my Grandparents house, only they weren’t home! So my brother and I started making the calls to the family, Pyper was on her way! We had to be at the hospital by 8:00 that night so Chad and I went to dinner and drove in to the hospital. 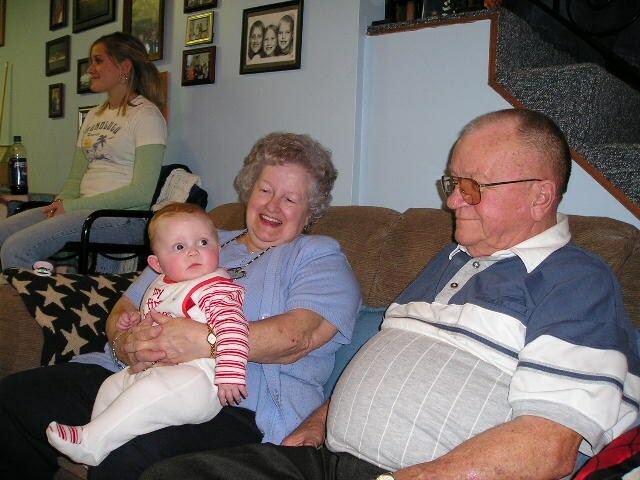 Not too long after we got in the room Gram, Grandpa, Ben and Mom showed up. 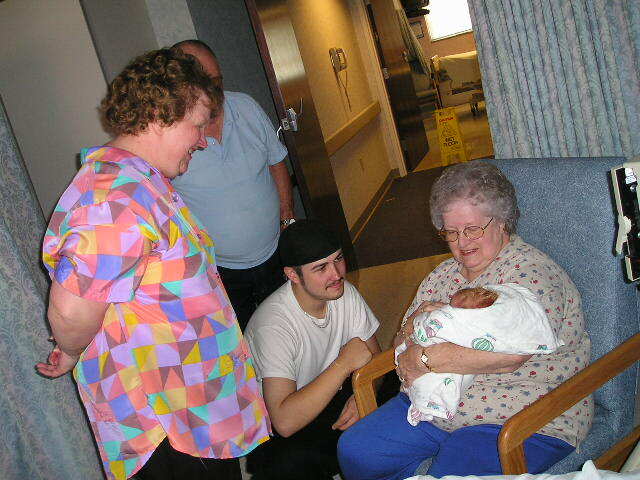 I was in labor for a very long time so my everyone left for a while but Gram and Chad. She was with us the whole time, then 24 hours later came a C-Section I just wouldn’t dilate. So Chad went in and Gram called everyone back and waited. I had gotten motion sickness when I was in the ER and the medicine they gave me made me very groggy. 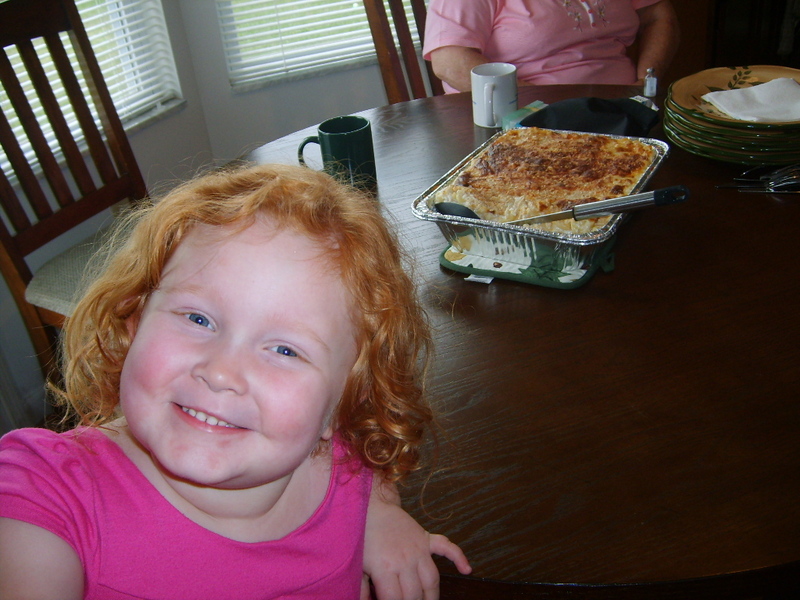 I don’t remember much of Py after the birth what I do remember was waking up a little in recovery and seeing Chad feed her for the first time and while I laid there; I saw my family and my sister in law Dawn. 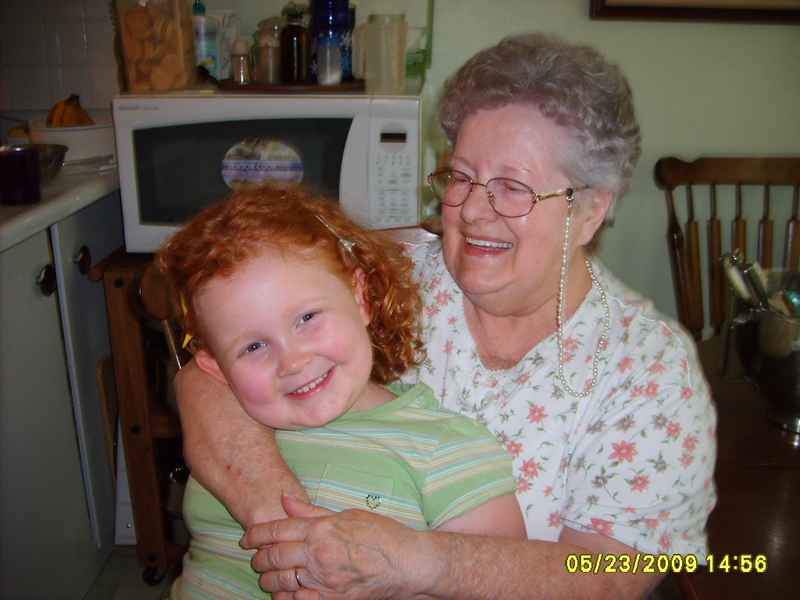 Gram was stroking my hair telling me how beautiful my daughter was. 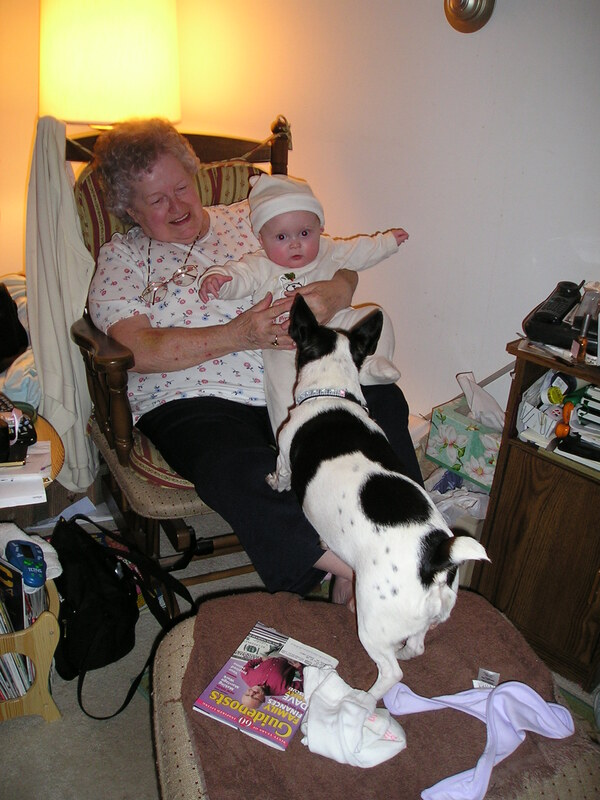 When Py was done eating Chad handed her to Gram and she placed her in my arms only I was so drugged I thought she might roll off! 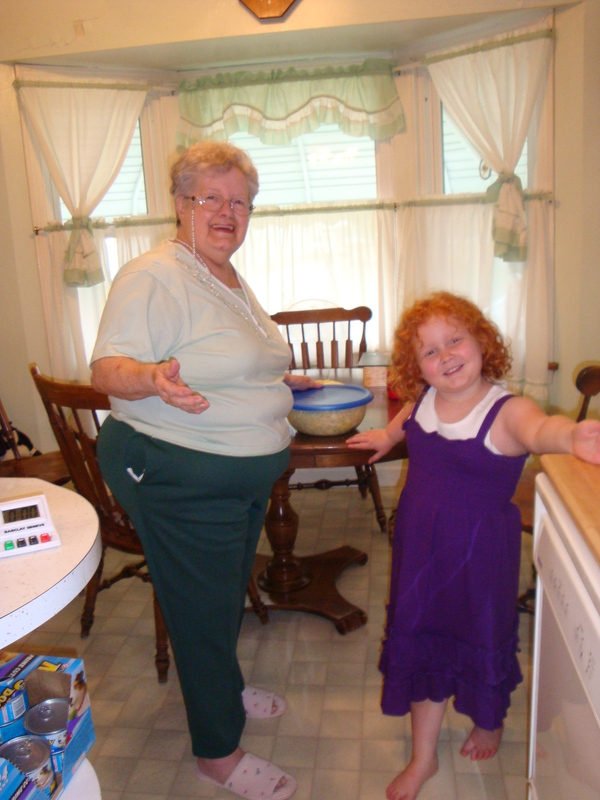 Gram assured me she would be just fine and so she was. 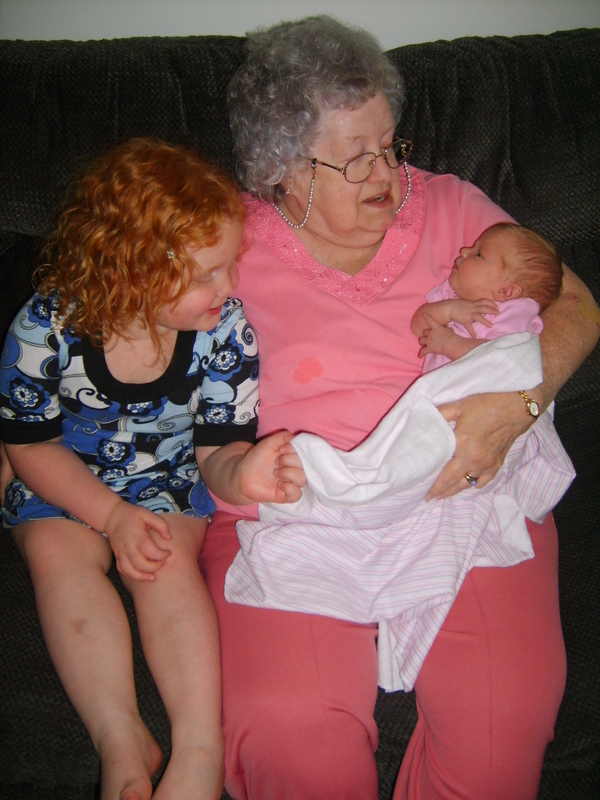 Gram even gave Py her first bath because I had no idea what to do. 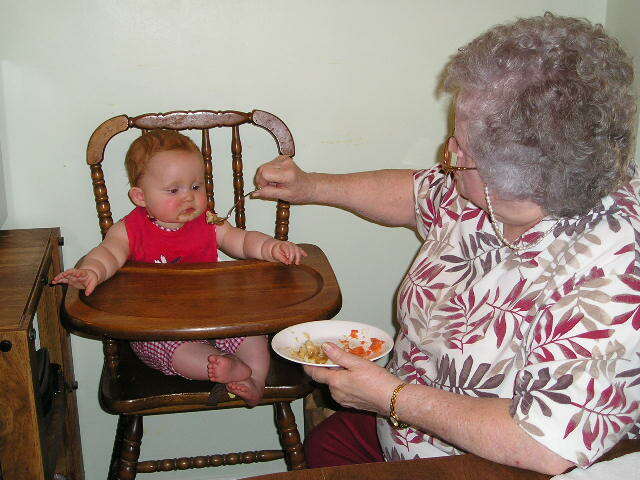 Do you see the love in that tiny one’s eyes for her Gram? 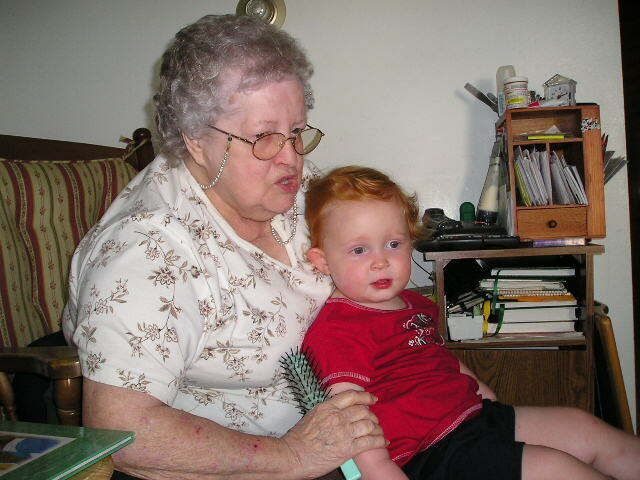 Gram loved to talk about that red hair too just like her first-born…… my Mom. 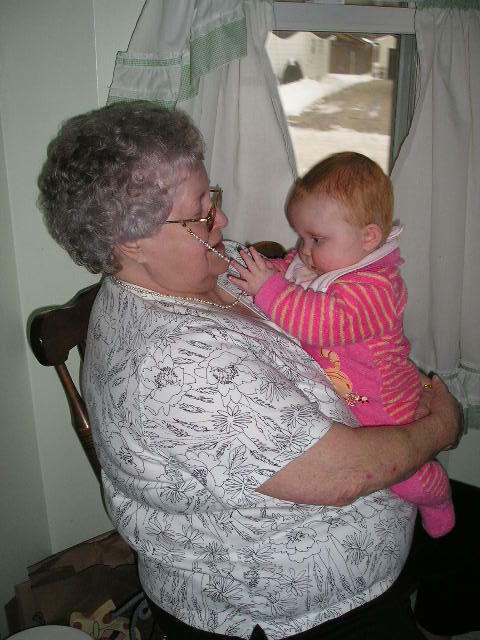 Then PapPap would hold her for her nap while Gram and I played SkipBo…..
And if we weren’t at their house they would walk down to mine I loved that. I missed that so much when we moved two hours away I had a pretty hard time without them. I tried to get up there as much as I could, now I feel like I should have been there more and will try harder for Grandpa. 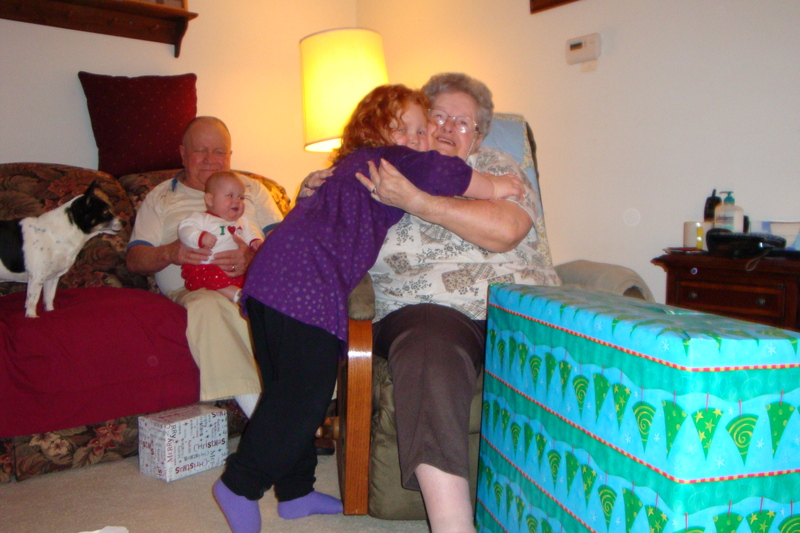 She was eager to just hold Py the whole time we were at the big family Christmas so Chad and I could eat and visit, I used to be accused of holding her too much from some people they should have seen Gram! 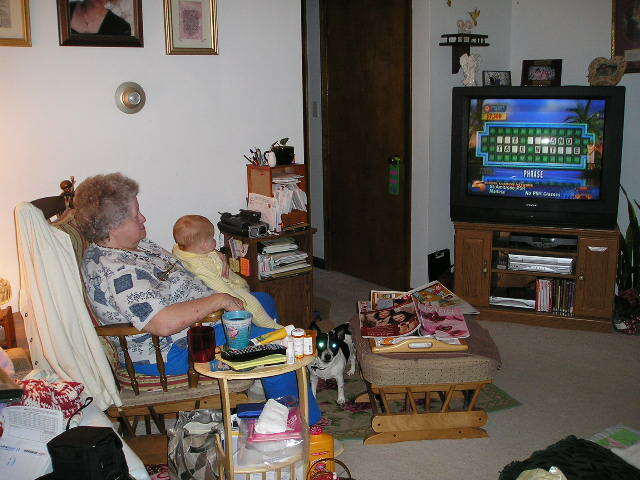 Gram even shared her favorite show with Py…WHEEL >>>OF>>>FORTUNE!! 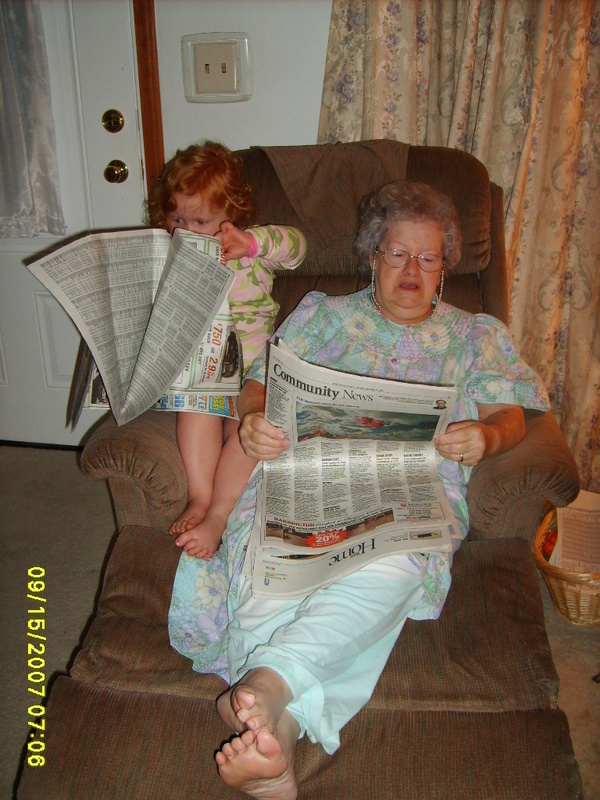 Pyper loved learning new things from Gram and there was always something new…..From the love of fine jewelry…. 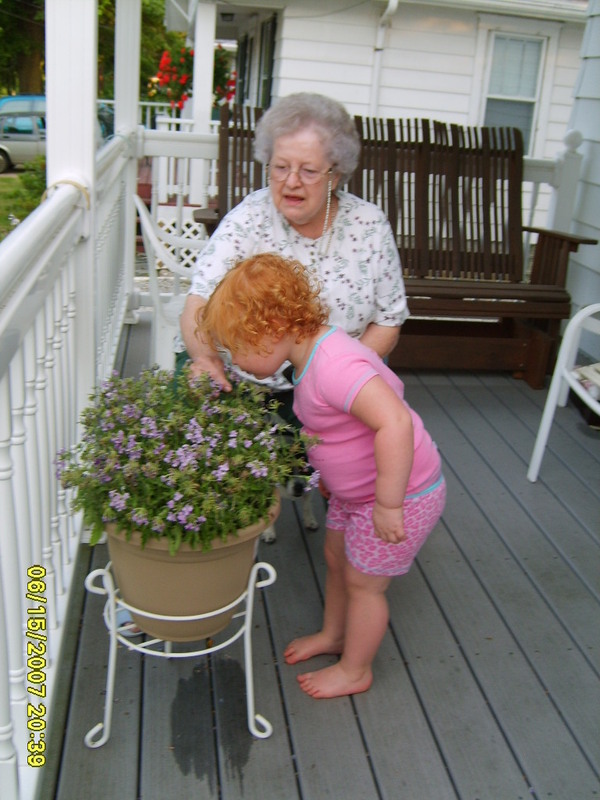 To trying new foods (she always ate better for Gram than she ever did for me) even to this day I can cook something she will not like it, if we go to Gram and PapPap’s and Gram makes it, it’s the best thing she ever tasted silly girl……..
Gram taight her about weeding the flowers in the flower pots …. Or even just to smell those flowers that she would remind her were not weeds…. 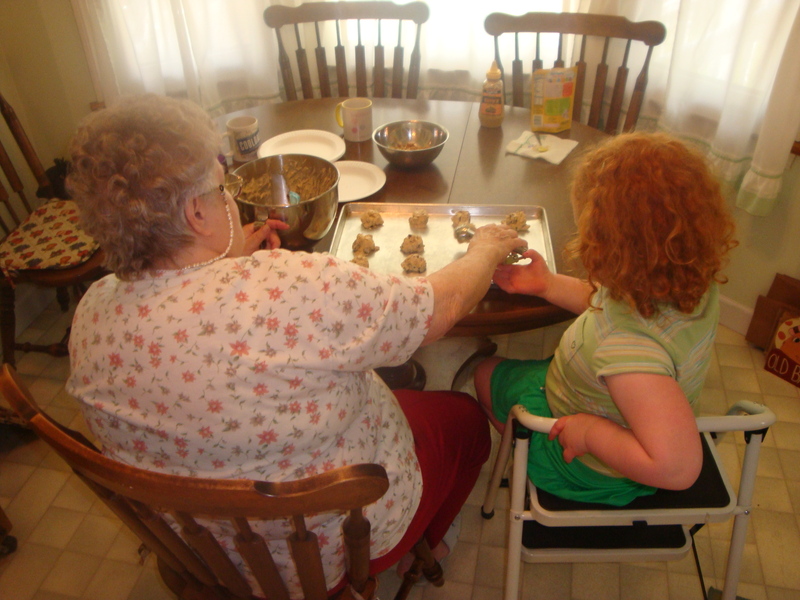 When Py got older Gram started to let her cook with her, Py looked forward to this every time we visited they made everything from homemade mac and cheese, macaroni salad or chocolate chip cookies…. 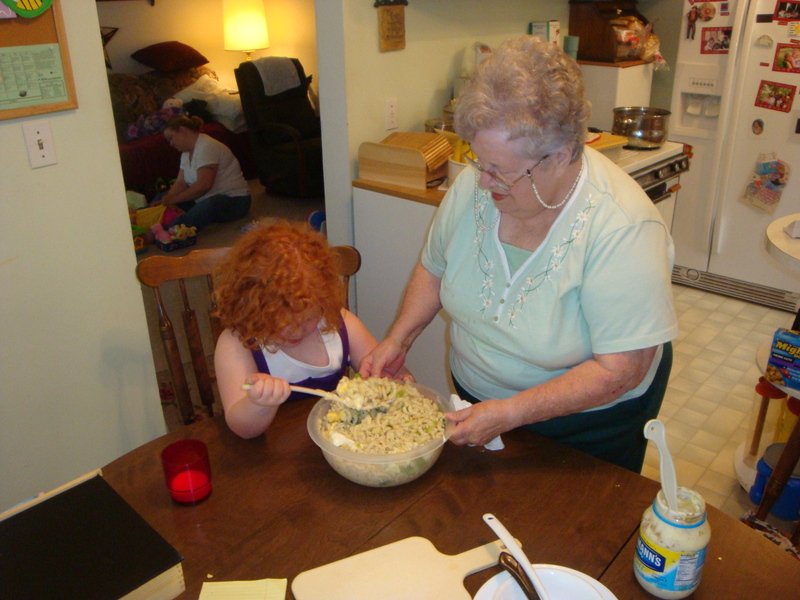 After making Gram’s famous macaroni salad the only mac salad she ever would eat…..
Then……..Pyper was so excited when Phoebe was born Gram, Grandpa, Ben and Mom all drove down for the birth. Pyper stayed in the waiting room with them and my in-laws. They all made Py feel so special being a big sister. They went back that night but came back down the following weekend to help where they could. 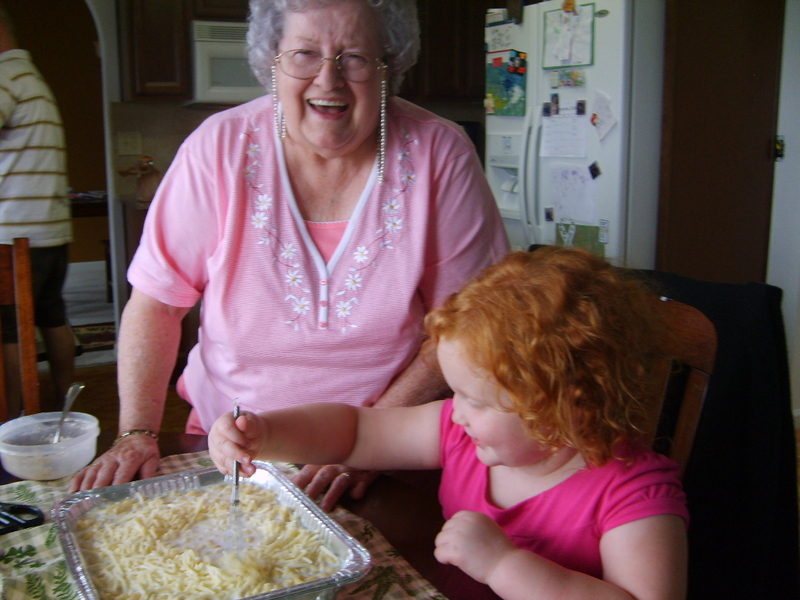 Of course Gram and Py made the mac and cheese! 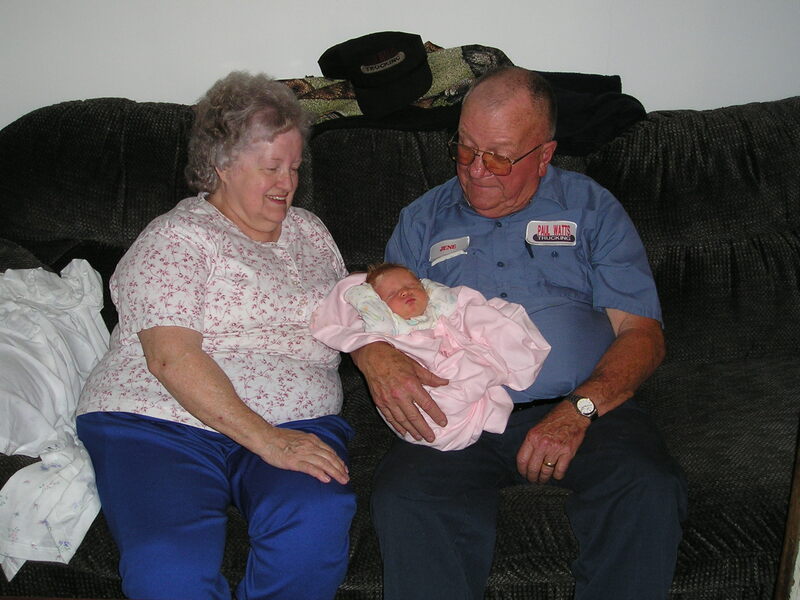 And Py just wanted to share her grandparents with the newest addition. 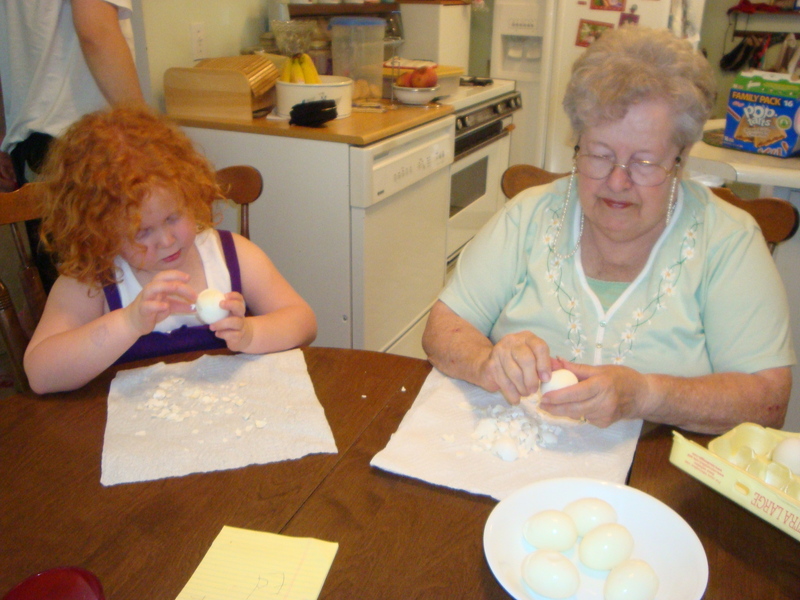 The last time Pyper saw Gram was at Easter, when we went back to spend the weekend Py had stayed over at her cousins and didn’t see her. 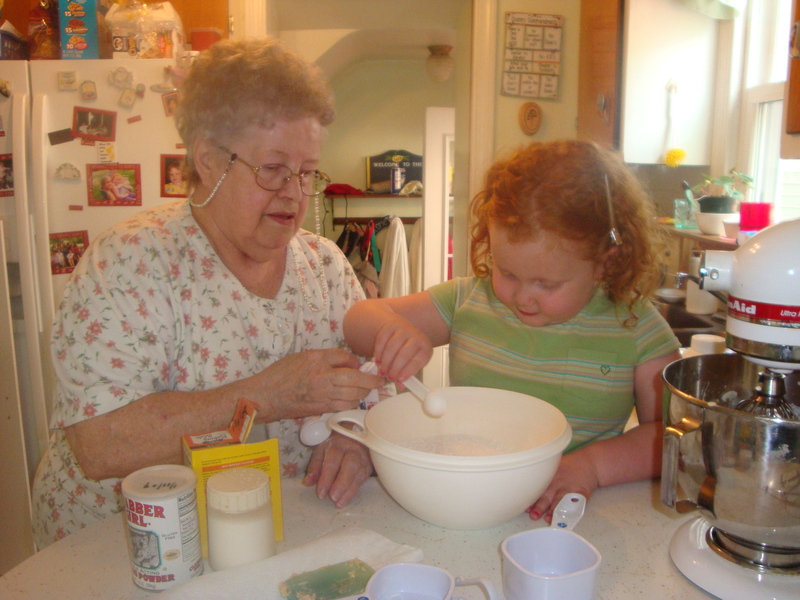 Phoebe was so good that weekend Gram. 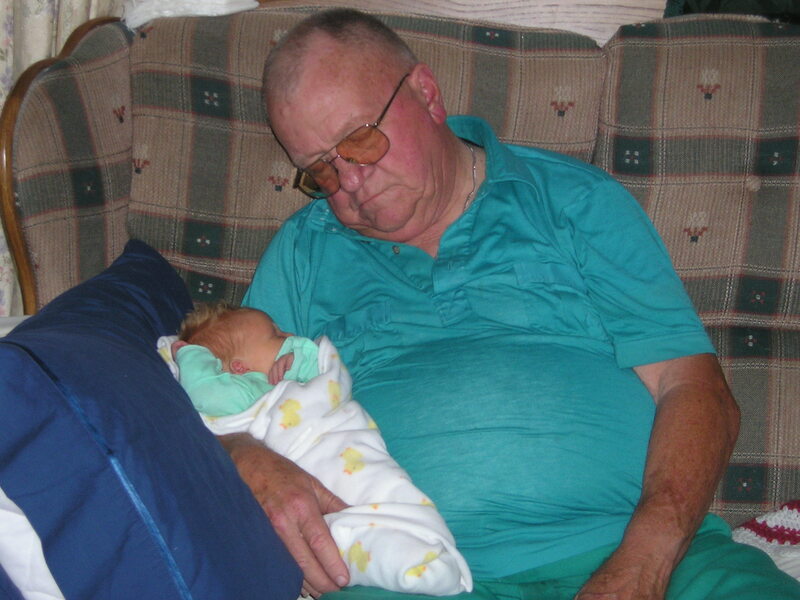 Mopm and Grandpa really enjoyed her. 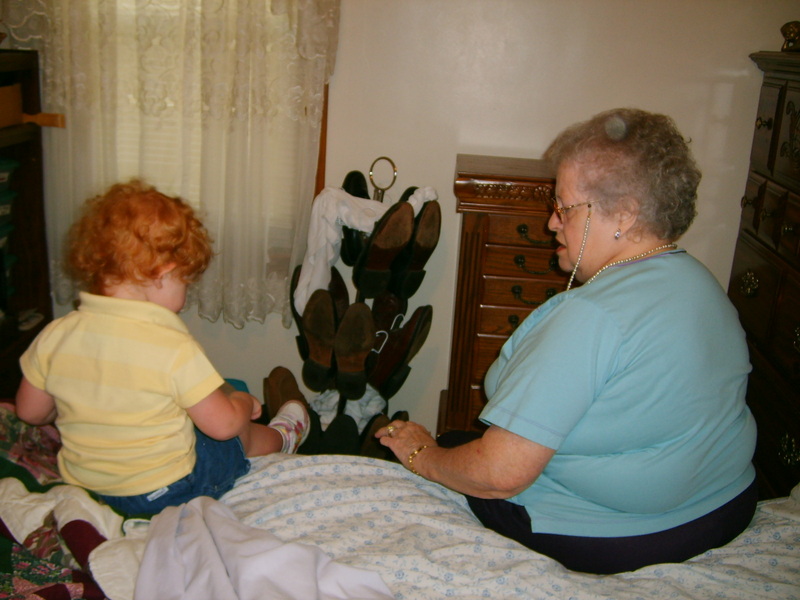 Unfortunately, Gram ended up in the hospital the weekend after that and told me not to come up she was fine just wait so I did. We had planned on spending Mothers Day with her and Mom. She died at 9:20 on Mother’s Day we were almost to the house. 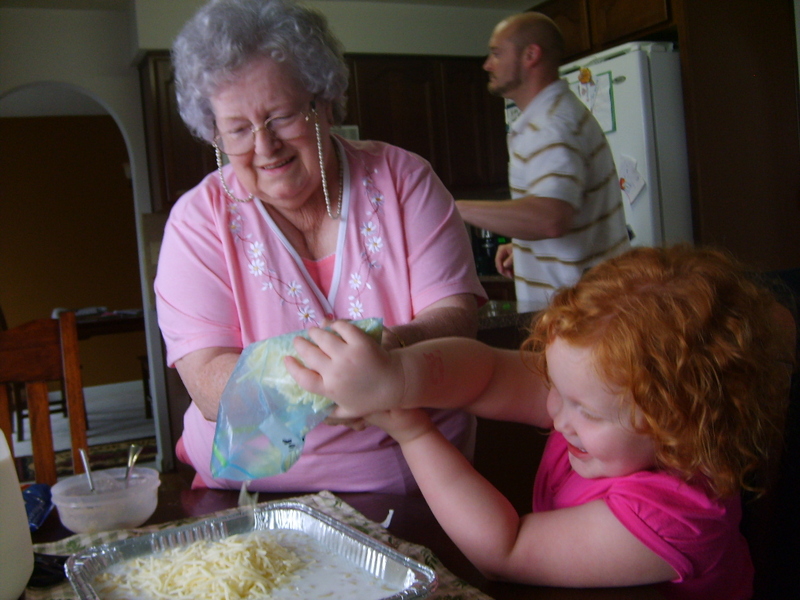 i do miss your grandma too….i loved her mac and cheese thats what she would always make when me and ben would stay in the basement and play video games all day…lol…your grandma was like my second mom she was always there to tell me when we were doing something wrong but always there to show love and compassion…i will always miss her and i don’t think i will ever eat baked mac and cheese again…she was the best and i will miss her untill we get to see her again in heaven! Oh, Jamie! 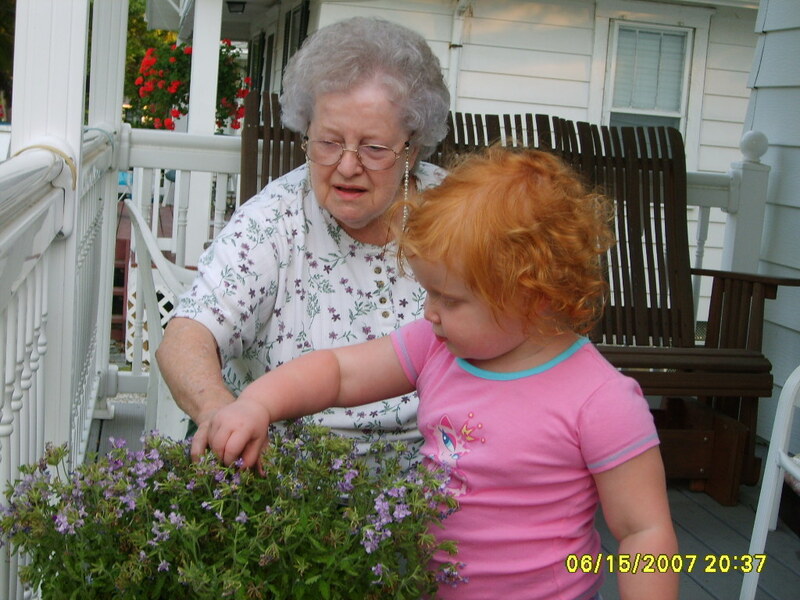 What a treasure that you have all these photos of the everyday moments with Pyper and your Gram! 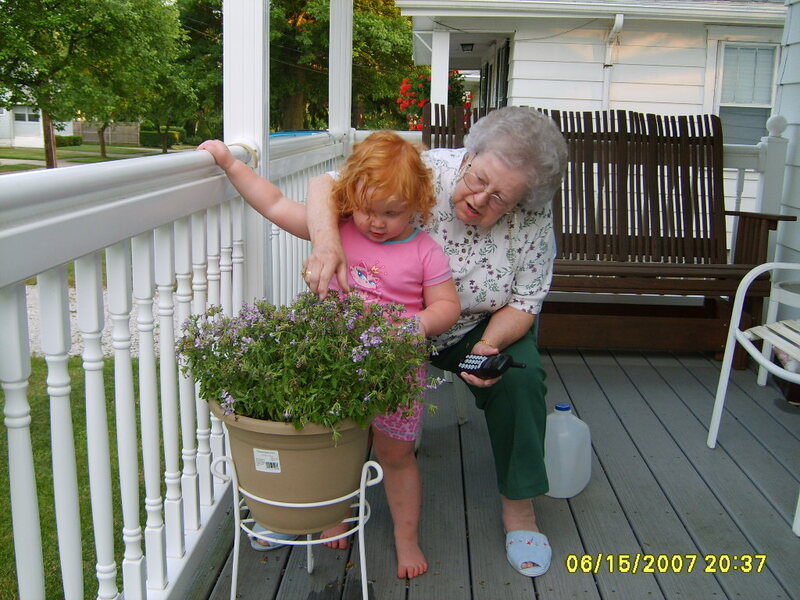 I wish I had pictures of those kind of moments with my grandparents. She will really cherish those even more as time goes on. I’m keeping you and your sweet family in my prayers. I am still keeping your family in my thoughts – I know this is a difficult time for you all. What fantastic memories for Py… and you have made them all the more special for her.